I didn’t intend to run my first ultra in a blizzard. The Zumbro 50 Mile, which started at midnight on April 14, seemed like a great spring race and motivation to run away the winter blues, but spring forgot to come, the forecast predicted over half a foot of snow, and my shoes weren’t up for the job. Six hours before the race I drove to a hardware store and bought the knobbiest-looking sheet metal screws I could find to give my shoes more grip on a slippery course, and then I fired up the power drill. On the drive north to Zumbro Bottoms State Forest in Minnesota, Joel Braden (a veteran ultrarunner), Jason Nicholson (our crew) and I nervously laughed as we watched the Doppler radar show progressively worse weather. As a native Californian, I didn’t know what pink meant: freezing rain. When we got within 30 miles, the car began to slide around on the icy roads. The forecast was no joke. We arrived at 11:20 p.m. – ten minutes before check-in ended. The rapidly deteriorating road conditions had added an extra hour to our drive. We hurriedly changed in the car and mentally prepared ourselves for what lay ahead. In those few minutes the light from the main camp at the start/finish line became muted under a blanket of snow on the windshield. Slightly after midnight, race director John Storkamp gave an unusual prerace briefing telling everyone there was no shame in not starting or dropping out at the first aid station only three miles away. 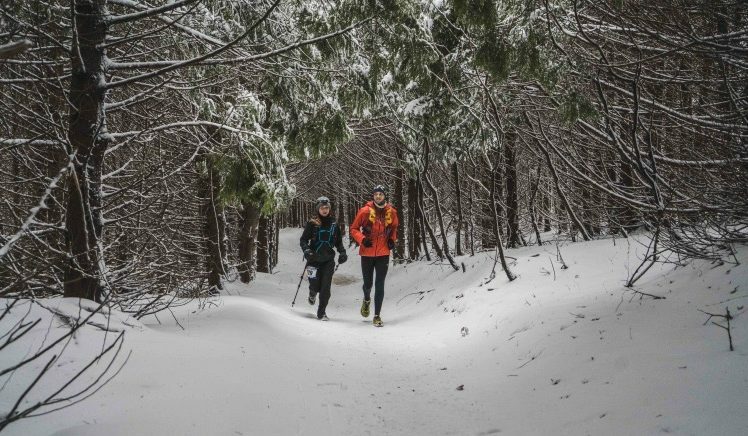 He said the conditions were so bad that half of the 100-mile runners had already dropped and crews were not advised to go to any of the aid stations. I wondered out loud what I had gotten into. The race began and we shuffled through the powder and out of the campground. The snow quickly turned to mud on the narrow single track. It was so thick I almost ran out of my shoes. I should have tied them tighter, but that wouldn’t have stopped the mud and nearly frozen water from seeping into them. The squelching made me think this 50-mile might turn into a 5k. Halfway through the first lap, Joel and I picked up a third runner, Amanda Theisen. Fittingly, she was studying exercise science in college. I thought to myself that at least she knew what she was getting into. My audacity to run Zumbro in these conditions kept crashing over me. Even the three pieces of candy I ate at the previous aid station made me almost vomit. At the end of the first of three laps, I half hoped my IT band would flare up, as it had earlier in the year, and give me a good excuse to drop. It didn’t though, so I trudged out into the darkness again for lap two. There was no way I could tell my friends and family I dropped because I ate too much candy. Lap two reminded me why I decided to try ultras. Not only was I pushing myself farther than ever, I wasn’t stressed like I get during road races. And everything I thought was a hindrance was now helping me. The mud that challenged everyone in the first lap had frozen into a solid, albeit bumpy, surface. The snow made the downhills less slippery. When the sun rose, the snowfall eased up and it felt like we were running through Narnia. The raging wind and blowing snow didn’t bother me; I enjoyed it. I never thought I’d be thankful for a snowstorm during a race. I didn’t crush that lap. After the first couple of sections, reality hit back hard. I was running strangely to take pressure off my IT band and other muscles started to hurt. A roughly mile-long ridge had winds exceeding 75 mph and waist-deep snow drifts. Every inch of exposed skin stung as we braced left, into the wind, to stay upright, and kept sinking into snow up to our knees. Hiding behind a tree, I pressed on my cold, wet toes to check for feeling. They hurt – no danger of frostbite yet – but it was time to get off this ridge and finish. Zumbro wasn’t done with us though. Trees had fallen onto the trail since our previous lap, hail pelted our faces, and our core temperatures were dropping. I think my body forgot how to warm itself, despite my best speed-hobbling. As I began to plod up the hills, Amanda cajoled me. We were so close; I couldn’t slow down now. We passed through the last couple aid stations quickly, making sure to thank every volunteer we talked to. Incredibly, some had worked the entire race because their replacements couldn’t get there on the hazardous roads. When we finally reached the campground, I felt endorphins flood my system. Waves of shock and relief hit me as we finished. All I could think about was getting somewhere warm. I wasn’t sure I wanted to try ultrarunning again. The race results weren’t exactly inviting. This year only 20 runners out of 120 finished the 100-mile race – that’s only 17%, down from 65% last year. And 49 out of 175 finished the 50 mile race – only 28%, down from 79%. Nine days later I signed up for my next race. Great outlook on an unexpectedly challenging race. Congrats. Great job, that just sounds terrible. Not sure many of us hardened mid-westerners would have finished.